Are you a retro kind of guy or gal? Do you hate the Windows 7 Start Menu, and wish it functioned the way the Start Menu used to in the good old days before Windows Vista? If so, you'll want to download the free CSMenu, which lets you navigate the Start Menu using the old-fashioned flyaway approach. 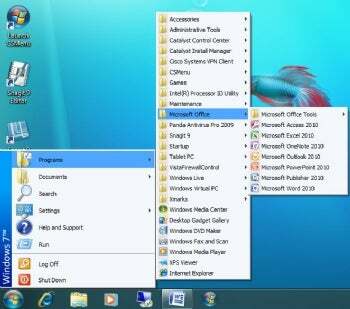 CSMenu lets Windows 7 users go back to the retro Start Menu in use before Windows Vista. CSMenu gives you the best of both worlds, because you don't have to give up the new-style start menu. It runs as a separate program, and still lets you retain the existing Windows 7 Start Menu. So click on the CSMenu icon for the old-style menu, or the Windows 7 Start button for the Windows 7-style Start menu. It takes a little bit of effort to get the program working. After installing, look on your desktop for the CSMenu First Run icon. Double-click it and it scans your system, looking for your applications. After it completes, log off, then log back on again. After that, delete the CSMenu First Run icon and drag the Launch CSMenu icon to your Taskbar. Then click the icon, and you'll see the old-style Windows Start menu, in all its retro glory.